Ahem! We demand your attention! 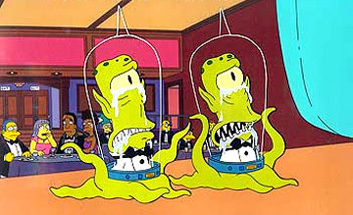 I am Kang, and this is my sister, Kodos. Last month, we had planned a one-time guest appearance to discuss the stupid movie industry with you foolish and easily distracted human beings. It turns out that you are so idiotic that many of you have requested that we return to abuse you even further. We are very busy and do not have time for you! Nonetheless, we will take a few minutes from our busy schedule of controlling Fox News and greenlighting Rob Schneider movies to light up your life for a few pitiful moments. The month of August is pathetic for your movie industry! Remakes of '80s television shows? A Terry Gilliam film? A Deuce Bigalow sequel? And you Earth creatures will shell out your hard-earned cash for two hours of this mind-numbing stupidity! Are you kidding us? We marveled when you made this show a television hit, and we're even more confused that you want to see it as a movie! But it has Jackass! And Stifler! And Jessica Simpson with things bouncing up in her undercarriage! This will be Burt Reynolds' big comeback! He loves Uncle Jesse! And you love the Bandit! Speaking of which, it is time for us to plant the seeds for a Smokey and the Bandit remake. This time with even more elephants! The Dukes of Hazzard will be the biggest hit of the month and we will laugh about it for a year. Our years are much longer than yours, by the way. Remember Steve Carell? He loves lamp! That is probably why he is still a virgin! He will be the next Will Ferrell, though, because he is a good yeller! And Judd Apatow is the director of the film! He looks forward to That '90s show even more now, Mark Brazill! He laughs in your stupid face! What will you do without Topher Grace? What kind of a world do you live in when a guy who was once in a band called The Funky Bunch is one of your great movie stars? And that's not all! The Hey Ya guy is in the movie, too! Didn't you get enough of that song when it was played over and over again on all your Kang and Kodos owned Clear Channel stations and in every sports bumper intro? We guess not! Mark Wahlberg and Andre 3000 look just alike, don't you think? Now that Goldie Hawn is old and saggy, we have replaced her with Clonebot Hawn #77. You people here on Earth know her as Kate Hudson! You loved Almost Famous! You did not love Raising Helen! But you will watch Skeleton Key because it has voodoo and it is already mind controlling you even as you watch the commercials! Lord knows you're a voodoo child, baby! Airplanes are scary! Spaceships are far safer. We mean alien spacecraft, not your shoddy human-built stuff! We are really getting to the dregs of summer now! Cillian Murphy is failed Clonebot Depp #149! He is a rogue and you should report him to us if you come across his path! Come on, Deuce Bigalow! You can do eet! Undercover Brother is in the movie, so you will love it! This sequel will be just as good as Miss Congeniality 2! What the world needs now is more horrible CGI films with Ewan McGregor as the lead voice! Didn't you fools learn your lesson with Robots? You know what is a great subject for a cartoon film? Pigeons! The rats of the bird kingdom! Only a rat movie itself would be better! Pixar is listening to us! Terry Gilliam cannot control a movie set! It is amazing that studios keep working with him! There is no advertising for this movie! It seems like a scary and suspenseful movie but it is also funny. This is what fairy tales are, but no one reads fairy tales anymore! Your loss! Read a book! This movie is only being released because it has to be dumped before the Weinsteins leave Miramax! The Weinsteins are awesome! They will soon lead the entire entertainment industry! If they can just partner with Steve Jobs and Pixar, Mickey Mouse will be cat food! Viva WeinsteinCo.! There are so many awful movies hitting theaters this month, we could have put any number of them at the bottom of our list. This one might be good, so we will give you the benefit of the doubt and think that you might show some taste. Though if you were really going to show any form of intelligence, you would be going to see Bill Murray in Broken Flowers! Instead, we know you will throw money at The Cave, Undiscovered and Supercross!